Reformed Theology- is that branch of theology that developed out of the Protestant Reformation through men such as: William Farel, John Knox, Huldrych Zwingli, and more particularly John Calvin. Matter of fact, Reformed Theology is so closely associated with John Calvin that it has been nicknamed 'Calvinism.' Martin Luther, in his protest against the Roman Catholic Church, reformed certain areas of theology, but still clung to the Roman Catholic traditions in other areas. However, unlike Luther, Calvin sought to Reform all areas of theology, bringing all of theology back to a Biblical foundation. However, this is not say that Calvin rejected creeds of the early church. Calvin recognized that the church had already settled certain points of theology; points which can be found in the Nicene Creed and the Council of Chalcedon. But in the end, what concerned Calvin when developing his theology was not what church traditions declared or pronounced upon the masses, but what concerned him the most is what saith the Lord. 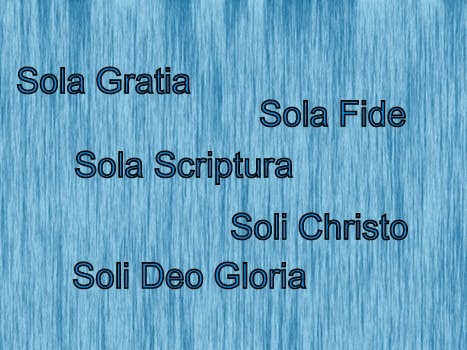 Therefore, Reformed Theology is God-centered, Christ-centered, and is founded upon the five solas listed at the top of this page in the banner. Reformed theology- is generally considered synonymous with Calvinism and most often, in the U.S. and the UK, is specifically associated with the theology of the historic church confessions such as the Westminster Confession of Faith or the Three Forms of Unity. There are many articles here that do not deal with Reformed Theology in particularly, but deal with the Protestant Reformation in general. Until I can find time to develop a page on the History of the Protestant Reformation, they will remain here. I already have a page that is labeled 'Gospel centered' and 'Tulip.' Some of these links would fall under those categories and could properly be placed on those pages. However, both of these subheadings: 'Gospel-centered' and 'Tulip' would fall under the umbrella or main heading known as Reformed Theology. One final note: Many believe, in the making of the Protestant Reformation, that one view of covenant-theology emerged. However, this is not the case. There were several views concerning covenant-theology that developed out of the Reformation. Therefore, there are several links here that are associated with what is known as 1689 Federalism or Particular Baptist covenant theology. When I have the time, subheadings will be placed in this page and everything organized as it should be. Justification by Faith Alone by W. Gary Crampton, Th.D. Luther was the leading figure that God used in order to bring the light of the gospel back into the Church. Wherever the gospel is preached however, controversy will ensue. This was so true concerning what Luther had to deal with after he began to preach the gospel. Nevertheless, he stood his ground, even against such men as Erasmus. Therefore if one would like a summary of the issues between Luther and Erasmus, one can download this short PDF that gives a brief description of Luther's interactions with Erasmus. Reformation and Reformation Day by Hershel L. Harvell Jr.